Substitute 1 1/3 cups of Farmers Market Salsa in place of the last three ingredients. Bring the vegetable broth and seasonings to boil in a medium saucepan (2 to 3 quarts). Add the rice, salsa, corn and beans. Turn heat to low, cover pot, and let cook undisturbed for 10 minutes. 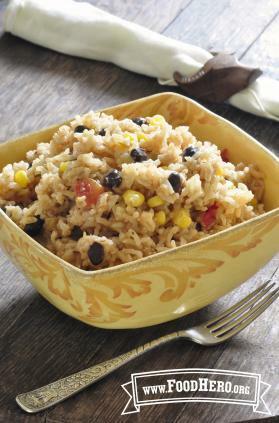 2 Comments for "Spanish Rice"
This is so fast and such a great side! No one knew it had brown rice. I would love to find a way to also cook this with regular cook (not instant rice). We make it with the individual spices rather than the taco mix and have hot sauce and a dollop on low fat sour cream as toppers.